The Simons Foundation is delighted to announce the formation of the Center for Computational Quantum Physics (CCQ), in the foundation’s new Flatiron Institute, and the appointment of Antoine Georges as its director. A new era is dawning in our ability to understand and control the behavior of materials and molecules. The CCQ will develop the concepts, algorithms and computational tools needed to handle many-body quantum systems and capture the quantum dynamics of electrons and ions in chemically realistic environments and make them available to the scientific community. The center will also host a lively array of meetings, workshops and conferences, serving as a focal point for computational materials science internationally. At full strength, the center is expected to comprise up to 60 scientific and support personnel, including both junior and senior positions, as well as sabbatical and summer visitors. 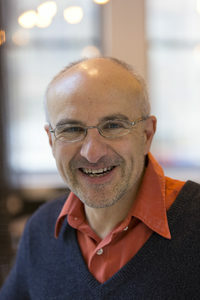 Antoine Georges holds the chair in condensed matter physics at the Collège de France and is also professor of physics at Ecole Polytechnique and at the University of Geneva. His work has been recognized by numerous fellowships and awards, including the Anatole and Suzanne Abragam Prize of the French Academy of Sciences, the 2004 Prix Dargelos, the 2006 Condensed Matter Europhysics Prize, the 2007 Médaille d’Argent of the CNRS, a 2012 Synergy award from the European Research Council and the 2014 Hamburg Prize for Theoretical Physics. He is a member of the French Academy of Sciences. Andrew Millis, professor of physics at Columbia University, will serve as co-director of the CCQ. In September 2017, the CCQ will begin operations alongside the Centers for Computational Astrophysics and Computational Biology already installed in the Flatiron Institute’s newly renovated building, across the street from Simons Foundation headquarters in Manhattan.